In the 1990s, I attended a conference convened to examine the environmental impact of the Parana-Paraguay waterway on the Pantanal of Mato Grosso. The day before the conference, I had dinner with an engineering colleague. Among other topics, we discussed the subject of free-surface instability, and I came away from the meeting greatly impressed by his grasp of the subject. Later, we traveled to the city where the conference was to take place. The presentation given by my colleague was highly technical and was delivered in a monotonous voice. When my turn came, I summarized the findings of my work on the hydrologic and environmental impact of the Parana-Paraguay waterway. The last talk of the day was by a person who spoke in a very clear and engaging style, leaving no doubt that his was the best presentation. Pleasantly surprised, and seeing that his style was quite different from what I had observed earlier, I was curious to find out what he had majored in college. He said: "Communications." That explained it, but I could not help but wonder whether we had again been caught in the age-old predicament between form and substance. 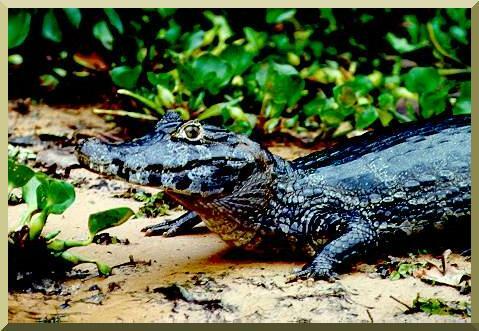 A caiman (caiman yacare) on the banks of the Rio São Lourenço, in the Pantanal of Mato Grosso, Brazil.